Another ring from a little while back. 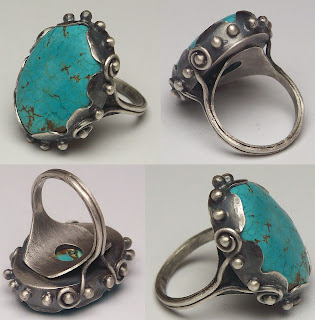 I had to share this ring, it is probably one of my personal favorites. Although it's really difficult to start picking favorites, it's just to easy to get attached to your own creations. Some times letting go of a piece of jewellery or art is like watching your kids grow up and move out on their own journey. Of course I can't truly relate to that simile, as I am not a parent myself, but it is a beautiful sentiment that I have heard other older artists impart.